Which equations can be defined between craft, technology, information, and matter? Where are its boundaries and how can they be tested? Furthermore, how does this become materialized in an era where science creates one atom thickness matter (graphene), tests the anticorrelation of materials in the unforeseen frontier of strange metals? Science in a broad perspective is as much about establishing objective deductions as about surveying possibilities. And it does so, by establishing unfathomable constructs around material theory and production. Is there equivalence in how we are conceptualizing and forging material systems in architecture? Or should there even be one as the creation of matter becomes a potential architectural program? Inspired by nature’s principles of efficiency, architects are establishing emerging material technologies through pioneering collaborations with scientists which comprise unforeseen scales of investigation. 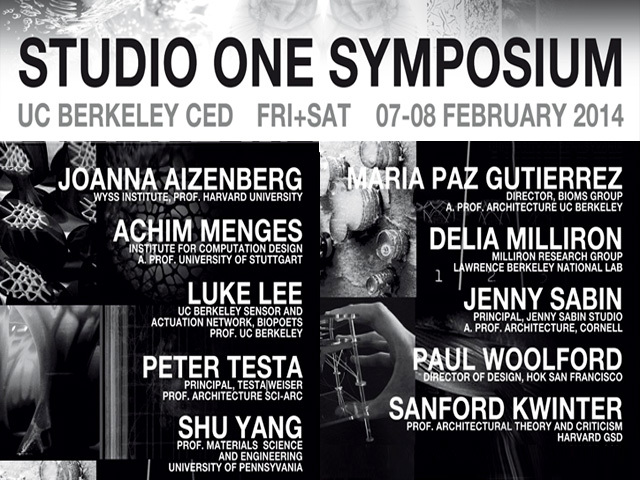 The Studio 1 2014 Symposium will expose the processes, challenges, and contributions of these experimental interdisciplinary research models in which matter is programmed through multiscale design. Fueled by interrogations around the nature of programming of matter and of programming matter and nature, architects and scientists will discuss the potential paradigm shifts in architectural research and future building technology.